So, maybe I should be working right now, but Josie woke us up at 4am this morning with the crazy idea that it was time to hang out and chat. We finally convinced her otherwise somewhere around 5:30 which left me a grand 12 minutes before the alarm. I’m a little groggy today and coffee, or what they call coffee here, hasn’t helped much. Thankfully we have a short day today and my kids were working on presentations. Let’s start with the kids here. 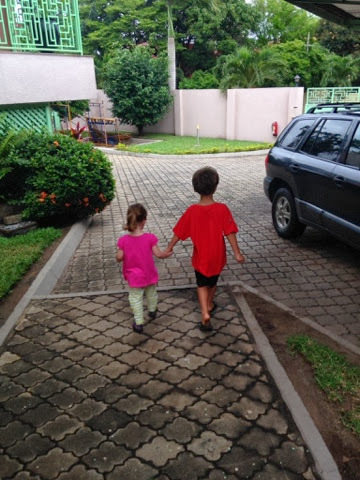 Josie told me this morning as she gave me a kiss, “I’m going to miss you while you’re gone.” I love it. She regularly hops down from the dinner table to dance, but not before informing us that its ok and she’ll be right back. I wish you could see the looks she gives us as she says this and wags her finger at us. Priceless. I’m pretty sure some of her moves are taught in Modern Dance 207 at Berkley. She gets in the zone man. I’ll try to dig up some video to share on here at some point. Her other passion right now is role reversal. She’s the mommy and I’m the brudder and Robyn is the sister. She gets into that role and I go to bed and have breakfast and go to bed and have breakfast and go to bed… You get the idea. She also goes to work to help people sometimes. When she does that she lets me know that she will always come back home to play with me. I think it was Saturday afternoon that she was so into the role I could not get her to take a nap. She put me in the bed over and over and simply would not give in to the idea that she was not the mom. At one point she even went into the hallway with a pillow and blanket to sit while I go to sleep. Seriously? She’s got the routine down. Perhaps that because she is ridiculously stubborn about going to bed these days. But we won’t get into that right now. 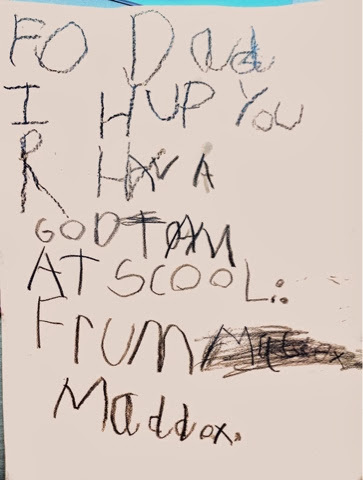 Maddox is in a writing frenzy these days. He loves school and every night he wants to write. 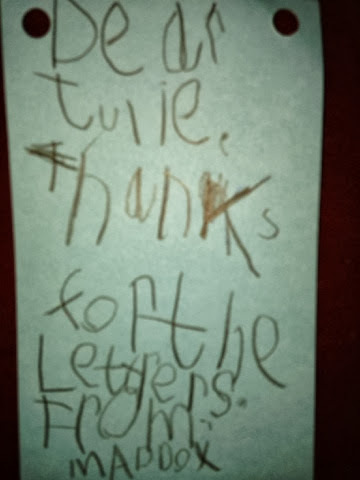 He’s writing notes to us, messages for his friends and just writing. Of course spelling isn’t really his forte right now, but he’s got some of the basics down. It is pretty cool watching his little brain working like a champ. I love how excited he is to learn right now. He has a book to read every night from school and last night they added a spelling list. Its fun sitting on the couch with him after dinner listening to him read. You would have thought the spelling words were a video game last night he was having so much fun with them. Tonight we gave Maddox a pair of keeper gloves. One of the kids at soccer Saturday had a pair last weekend and he has relentlessly asked for his own ever since. There’s no sporting goods store to run to, so we asked the Athletic director who asked her equipment manager who went to the market and found some gloves. You would have thought the boy found the Golden Ticket when I handed them to him. He was instantly in the hallway kicking the ball off the wall and falling all over floor catching it. It is fun to see a happy kid. 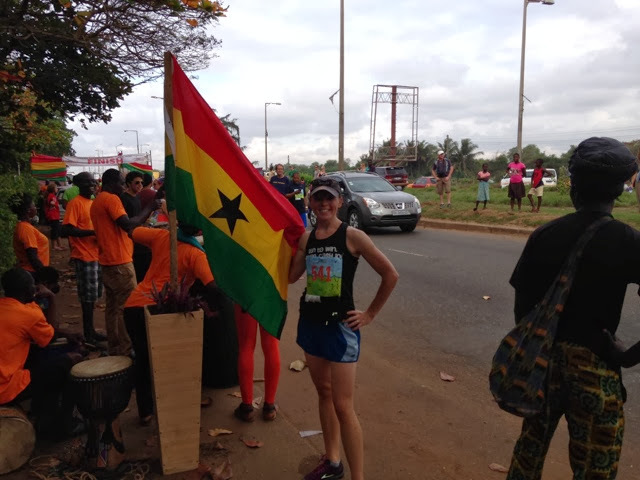 Robyn ran the 10k version of the Accra International Marathon last weekend. (After consulting with my agents and my training staff, I decided that in the interest of my career goals I would sit this one out). She did great, of course. Her description was something along the lines of it being a cross between a mud run and a 10k. The roads here are far from pristine and apparently there was a pretty good stretch of it on the side of the highway. She did say there was a nice stretch with a view of the ocean though. The finish line was at the Labadi Beach hotel and included three different drum and horn groups within the last 100m. It was pretty cool, if not a little loud. 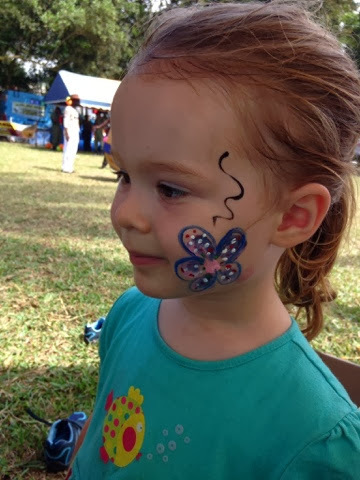 I brought the kids over for the conclusion and post race festivities which included fresh coconuts, face painting, a trampoline, food (eventually) and a mechanical bull. Yes, this is the land of randomness. Of course everything happened in its own time. 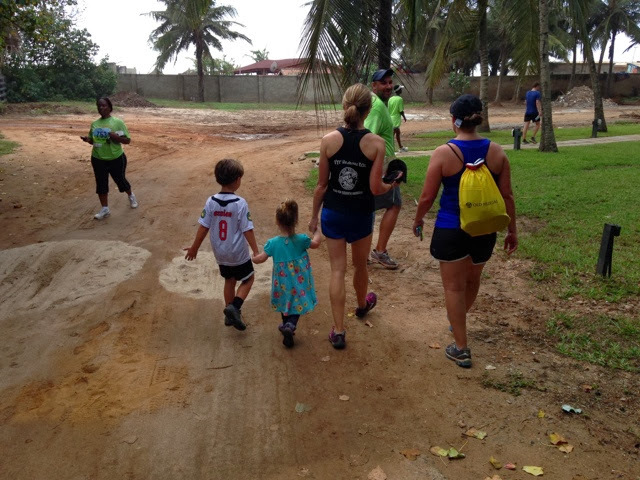 For the runners out there, it wasn’t like any post race you have ever enjoyed. Quite different. We had fun though and then headed home for a nap. I should mention that Robyn had to get up at 5:15 and the alarm I set may or may not have gone off and she might have run out of the house in less than three minutes when her phone rang and it was her friends outside to pick her up. Maybe that was why we were tired. I don’t know. As for me, I’ve finally started playing my guitar a bit again. I’ve played with Bastien a few times and last night I headed over to play with Vincent who works for the British version of USAID. (No offense to any Brits out there, I just can’t remember what he called it). Oh, yeh, it’s the guy who was singing Country Roads at the beach if you recall. Nice guy and we had a good time. He had a banjo and a mandolin he’s learning to play and we just kind of goofed around and tried some stuff out. I think he’s looking to start a regular band kind of thing. Could be fun. I’ll have to start looking for my ripped jeans and growing my hair again I guess. Finally, one piece of “this is just how it goes in Ghana”. We finally got our second debit card from the bank a couple of weeks ago. For whatever reason they both ended up having Robyn’s names on them. Whatever, right? Well she tried to use the new one assuming it had the same pin as the other since it had the same names on it, made sense. Well, apparently the third time is not the charm when it comes to wrong PIN numbers, because the ATM took her card. After a few emails and phones calls over the next couple of days she managed to more or less get it worked out. They said just come in to the branch and they would get us a new card with my name on it. In the meantime they would send her card back. Sometime later a guy walks into her office and pulls the card out of his pocket and hands it to her. Probably one of the same guys I saw kneeling on the ground in front of the open ATM in their jeans and t-shirts loading stacks of cash into the tray. Yes, they were loading it. Granted this was inside the school, but you just wouldn’t see that kind of thing happening back in the States. 02 Oct	This entry was published on October 2, 2013 at 8:51 pm and is filed under family, Uncategorized. Bookmark the permalink. Follow any comments here with the RSS feed for this post.